Africa's smallest country, the Kingdom of Swaziland is located in Southern Africa, where it is less than one percent of the overall size of bordering South Africa and Mozambique combined. 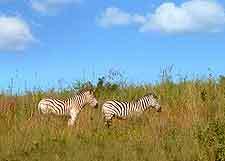 However, although Swaziland may not be especially large, it does come with plenty of appeal and many wonderful game reserves, where safaris will allow you to see iconic African creatures such as elephants, giraffes, lions and zebras, and more besides. There are a number of important towns and cities in Swaziland, with Mbabane being the administrative capital, and Lobamba considered to be the royal and legislative capital. 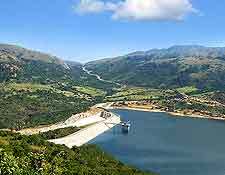 Both Mbabane and Lobamba reside on the north-western side of the country, although Mbabane should be your first port of call for tourist information - and cash, since ATM cashpoint machines are not available anywhere else in Swaziland. Mbabane's tourism bureau stands on the southern side of the Swazi Plaza, next to Plaza Mall Street, where it provides plenty of brochures, while in the Ezulwini Valley, Swazi Tours is another extremely reputable tourism outlet. There are only three monarchs still ruling in Africa, and Swaziland is home to one. However, this is not without its controversy, since King Mswati III often has outspoken views and enjoys spending considerable money living his extravagant lifestyle with his numerous wives, while the country remains amongst the world's poorest. Nevertheless, Swaziland is proud of its monarchy and royal history, and its related annual Umhlanga Reed Dance and Incwala Day festivals attract literally thousands of spectators. King Mswati III has invested much money in recent years, promoting Swaziland as a tourist destination with impressive game reserves, and as a tourism gateway to many spectacular neighbouring attractions and national parks. 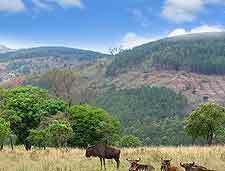 Swaziland's decent road network makes getting around easy, with those on holiday here often choosing to rent a car and drive around the popular Hlane Royal National Park, Mkhaya Game Reserve and Mlilwane Wildlife Sanctuary, as well as the nature reserves of Hawane, Malolotja, Mantenga, Mbuluzi, Mlawula and Phophonyane. Tourists based in the Ezulwini Valley may like to check out the Mantenga Swazi Cultural Village (Ligugu Lemaswati) or the Mantenga Craft Centre, and in the Malkerns Valley, Swazi Candles is a reliable place to come for souvenirs. Both the Ngwenya Glass Village and the Somhlolo National Stadium at Lobamba may also feature on your sightseeing itinerary. 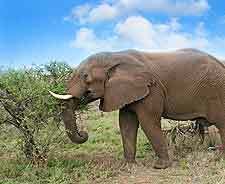 More information about Swaziland Tourist Attractions and Swaziland Parks and Game Reserves. 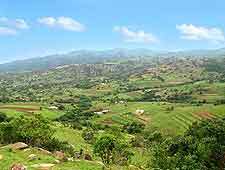 The landscape of Swaziland is one of large mountains, valleys and gorges, expansive lowland areas and busy modern cities. Overlooking Mbabane, the Sibebe Rock is a world-record breaker, since it is the largest granite dome in existence, anywhere. Guided rock climbs and hikes are the best way to explore this mighty monolith and the neighbouring waterfalls, caves and scenery. The Ngwempisi Gorge is another natural wonder, as are the extremely photogenic and much-visited Phophonyane Waterfalls. There are also a number of imposing manmade sights to see, such as the King Sobhuza II Memorial Park and the House of Parliament, both of which reside in Lobamba. Somewhat older is the Ngwenya Iron Ore Mine on the Bomvu Ridge, which has origins in the Middle Stone Age, and the Nsangwini Rock Paintings, a site of great archaeological significance. 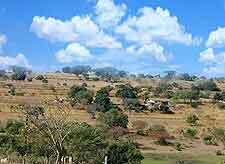 More information about Swaziland Landmarks and Monuments. Ruler of the country at the beginning of the 19th century, King Sobhuza I is widely regarded as being the founder of pre-colonial Swaziland and the country's father. He grew the nation and strengthened the monarchy, and today, the history of the kingdom is documented for all to enjoy at the National Museum in Lobamba. Here you will find information about the royal family, the country's biggest ceremonies, the Highveld and Lowveld regions, natural history and the traditional settlements comprising reed huts. Whilst this is the only museum as such, there are plenty of fascinating Swazi cultural villages and craft centres, such as the Guava Gallery at Mantenga, and the Indingilizi Art and Craft Gallery in Mbabane. More information about Swaziland Museums. 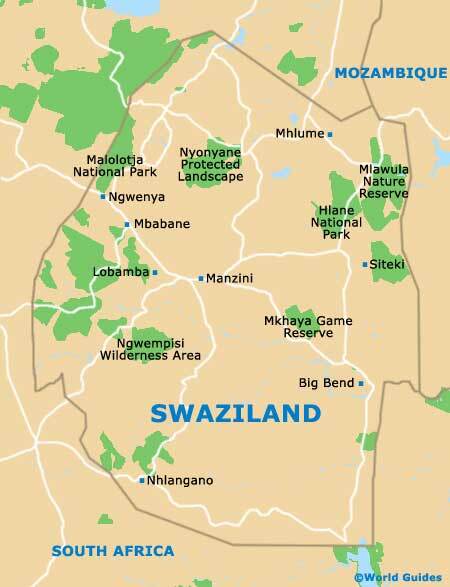 Swaziland is completely landlocked and is bordered by South Africa on its northern, western and southern aspects. Consequently, many tourists choose to head outside of the country, visiting South Africa's spectacular Kruger National Park (to the north), Johannesburg (to the west) and Durban (to the south). To the east is the Mozambican capital of Maputo, which makes for another popular Swazi excursion and boasts some of Mozambique's top tourist draws, often being located around its Praca dos Herois Mocambicanos and its Praca de Independencia, the latter of which is dominated by the Cathedral of Our Lady of the Immaculate Conception. 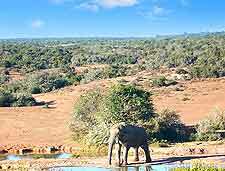 Also to the east is the Maputo Elephant Reserve, where a successful conservation programme has resulted in increasing numbers of protected elephants and rhinos. 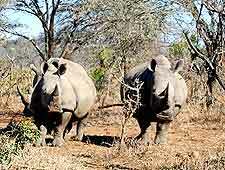 More information about Swaziland Attractions Nearby.